Classic flamenco shoes with black leather upper and buckle fastening. Rivets in heel and toe..
NEENA Satin Foldable Slipper Versatile shoe for: Belly Dancing, Liturgical, Kick Dancing, Wedd..
VEENA Metallic Foldable Slipper Versatile shoe for: Belly Dancing, Liturgical, Kick Dancing, W..
SHOE / 2083 ΠΡΟΣΦΟΡΑ !!! 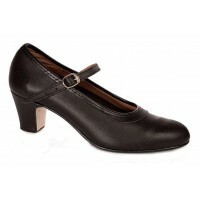 LEATHER *ΑΡΧΙΚΗ ΤΙΜΗ: 110,00 € ..
SHOE / FLAMENCA'S ΠΡΟΣΦΟΡΑ !! !